CC Meta Game - Is Open Season on Umpires MLB Ploy? MLB has a new anti-bullying campaign, but after CC Sabathia became the latest player to personally attack an umpire in the public sphere after Tuesday's Yankees loss to Boston (it just so happened to be Angel Hernandez), you wouldn't know it. We view the pitcher's criticism in the context of the umpires association's 2017 summation that the Commissioner's Office has tacitly declared "Open Season on Umpires" through its lax discipline for what the World Umpires Association (now known as MLB Umpires Association) then-deemed, "escalating attacks on umpires." CC called for an end to Angel's postseason. After his loss in the deciding Game 4 that clinched the American League Division Series for the Boston Red Sox, New York starting pitcher Sabathia stated, seemingly without much provocation, "I do need to say this, though. I do not think Angel Hernandez should be umping playoff games. He's absolutely terrible. He was terrible behind the plate today. He was terrible at first base. It's amazing how he's getting a job to play, to umpire in these playoff games...He shouldn't be near any of these playoff games...He's bad, I don't understand why he's doing these games." Yes, it is true that Hernandez's three overturned calls at first base during Game 3 was a postseason first. No, it's not true that Hernandez's performance behind the plate during Game 4 was "terrible." And in order for umpires to earn a postseason assignment, they must "meet a standard," which includes "balls and strikes...field work, rules, instant replay, and handling situations. Professionalism also factors into grading umpires," per Senior Vice President of Baseball Operations Peter Woodfork. Somehow, the "terrible" Hernandez has met this standard 17 times (plus two World Series), including an active four-year consecutive postseason streak (2015-18). On that note, there's a strong possibility Hernandez's replay results from Game 3 harm him in regards to World Series consideration, but at this point, that's neither here nor there. A better lesson in perseverance, perhaps, is how Hernandez managed to put Game 3 behind him and come out with a strong plate performance in Game 4...unless you were to check some of the opinionated comments on social media—facts be damned! After all, it's a pretty good distraction from New York's double-digit loss Monday night. Sabathia's postgame statement resembles Ian Kinsler's 2017 remarks regarding Hernandez when Kinsler, after Hernandez had ejected him for arguing a correctly called strike, stated, in part, "He needs to find another job. He really does. He's just that bad. I'm not mad at him. He just needs to go away...What is he doing on the field?" UEFL f/x statline for Angel Hernandez, 10/9. > Strike three call in the top of the eighth inning should have been ball ball one (benefited NYY/Betances). Said Rick Porcello, who benefited from one erroneous call, as did Sabathia, "throw the ball over the plate, CC. I thought Angel Hernandez called a good game. You have to put the ball over the white part of the plate and then you get strikes called. That's all I've got to say about that." We get to use this image again. 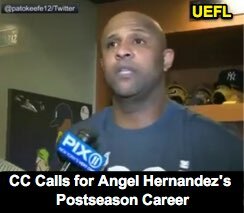 In their postgame comments, Sabathia and Kinsler directly referred to the status of Hernandez's career, Sabathia discussing the immediacy of Hernandez's postseason appearance, while Kinsler spoke of Hernandez's overall role in baseball. "Terrible" is a well-known, rather rudimentary, and universal insult—see Joe West's ejection of Tim Anderson—but suggesting that an umpire's career, well-being, or presence on the field should be altered as the result of a perceived wrong, such as Carlos Gomez's September 2018 social media statement, "if anyone needed to be ejected out of tonight's game it was Andy Fletcher" and associated comments, takes the criticism to another, personal, level. Threatening an umpire's career or well-being is never acceptable (or should never be acceptable). Although ESPN/MLB/X Games' Shred Hate bullying prevention program seeks to create a "tangible reduction of bullying incidents in schools by igniting the compassion of youth," Kinsler and now Sabathia have shown anything but compassion and MLB's inadequate action belies its commitment to Shred Hate while suggesting internal hypocrisy. Maybe just ditch the league-wide moniker altogether and leave Mike Trout as the campaign's sole role model, or substitute an antonym for "shred." OSIP helps officials experiencing abuse. On this October 10 World Mental Health Day, if you have experienced abuse or want to prepare yourself for officiating abuse, please consult our 2017 World Mental Health Day article at the end of this paragraph. You can also visit our Plate Meeting Podcast sponsor OSIP Foundation, which runs the Officials Anonymous hotline at www.osipfoundation.org/offanon.html for officials experiencing non-clinical issues related to abuse. And if you still don't think abuse is a problem, refer to articles such as Washington Post's Verbal abuse from parents, coaches is causing a referee shortage or USA Today's Abuse, pay driving referees away in public high schools. 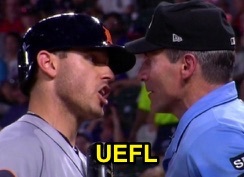 We've followed this storyline since 2017 when WUA noted that not only did players engage in a greater tendency to rail on umpires personally to the media after games or appearances that didn't go their way (sparked by Kinsler's comments), but that the league failed to adequately address the escalating umpire abuse. That spurred us to dig into the archives. The Office of the Commissioner has failed to address this and other escalating attacks on umpires. The player who denigrated Hernandez publicly said he thought he would be suspended. Instead [he] got far more lenient treatment—a fine. He shrugged that off and told reporters that he has 'no regrets' about his offensive statements calling for an end to Hernandez's career. The Office of the Commissioner's lenient treatment to abusive player behavior sends the wrong message to players and managers. It's 'open season' on umpires, and that's bad for the game. Umpire abuse tends to be good for ratings. You'll notice that MLB's failure to adequately act isn't limited to player criticism of Hernandez; for instance, the League similarly issued no suspension when Jonathan Papelbon said of DJ Reyburn, "he sucked...he probably needs to go back to Triple-A" (for the record, since that comment, Papelbon is out of baseball and Reyburn is a full-time MLB umpire), even when the league's own documentation provides ample opportunity for discipline. When MLBUA implored in September, "The MLBUA expects ACTION from the Commissioner's Office to uphold not only the integrity of THEIR umpires but the integrity of the game itself," it utilized language consistent with the MLBPA-MLB basic agreement, which holds that the Chief Baseball Officer may suspend a player without pay for, amongst others, "making public statements that question the integrity of the game, the umpires, the Commissioner and/or other Commissioner's Office personnel." Chief Baseball Officer Joe Torre is supported by Peter Woodfork, Senior Vice President of Baseball Operations. Woodfork's responsibilities include "oversight of umpiring and instant replay, among other baseball operations functions," which suggests he oversees Randy Marsh, Director of Major League Umpires. Might this crew of umpire executives do something to address MLBUA's concerns? When Rob Manfred named former MLB pitcher Chris Young as Vice President of On-Field Operations, Initiatives & Strategy in May 2018, the press release indicated that Young would report to Senior VP Woodfork and assist with on-field standards and discipline, suggesting, naturally, that Woodfork oversees said discipline. In May, the New York Times wrote that three men are ultimately responsible for issues related to discipline, rules, pace of play, and umpires: Torre, Woodfork, and the newly-installed Young. But Young was named to MLB in 2018...WUA n/k/a MLBUA's problems with the Commissioner's Office predated Young's arrival by quite some time, leaving just Torre and Woodfork in the hotseat. Garagiola suspended Votto in 2015. We would be remiss if we didn't mention the name Joe Garagiola, Jr., who previously served in the role of Senior VP of Standards and On-Field Operations for MLB. Garagiola is no longer in that role (he's now a consultant per his Arizona College of Law professor biography), which, again, refers to "on-field" discipline. (And, to the contrary, Garagiola during his tenure was credited in press releases with issuing a handful of suspensions for umpire abuse-related misconduct, such as Joey Votto's two-game suspension for his spat with Bill Welke in 2015...these days, perchance with Woodfork as the Senior VP of record, suspensions for umpire abuse seem rather rare, having been recently replaced with fines [Kevin Cash confirmed in September 2018 that Torre and Woodfork are in charge of discipline]). Related Post: MLB Ejections 196-197: Bill Welke (3-4; Votto, Price) (9/9/15). Or is this a case of "not-my-department-itis" since the violations technically occur off the field (though, why would Gomez be fined for a Periscope video rant if it was off the field...clearly discipline is intended to address and has been applied to off-field behavior as well)? There's a good chance the basic agreement doesn't specifically address Twitter, but the league's social media policy for players does. Baseball-Almanac got a hold of MLB's 2012 Social Media policy memo to players, which stated, in part, "In addition to the prohibition on the use of electronic equipment during the period beginning thirty minutes prior to a game and ending upon the conclusion of a game that is contained in Baseball Operations Bulletin A-2, Players may not engage in the following conduct with respect to the use of Social Media...Displaying or transmitting Content that questions the impartiality of or otherwise denigrates a Major League umpire" (emphasis added). But with specific regard to Hernandez, could MLB have an ulterior motive? After all, Hernandez is the umpire who is suing the league over allegations of racial discrimination. After all, what motivation does the league really have to save Hernandez's reputation or well-being (I suppose, perhaps, a hostile work environment claim with EEOC if it gets to a point where the league continues to tacitly encourage abuse of one of its umpires), especially given, as the suit alleges, Torre's purported animus toward Hernandez? Related Post: Angel Hernandez Sues MLB for Racial Discrimination (7/3/17). If MLB's strategy in the lawsuit is to argue that Hernandez's job performance disqualifies him from consideration for Crew Chief or World Series selection, could it perversely be in MLB's best interest to allow players (past and present), coaches, media, and fans to rake the 25-year big league veteran over the coals? For example, after Hernandez's ALDS appearance, and the backlash he received even in spite of scoring the highest plate percentage in the series, the damage already done during Game 3 (but let's be honest, Hernandez would have received fan and media criticism for his plate performance even if he called a perfect game...facts don't seem to matter), MLB would have an easier time showing that it would not be in the league's best interests to assign him the 2018 World Series—the negative response would just be too great. Or does the league have a duty to ensure that one of its Network personalities (e.g., Pedro Martinez) doesn't continually denigrate another one of its employees (e.g., Angel Hernandez)? Perhaps that's a question for another time. Yes, Hernandez did get overturned thrice on replay during Game 3...and then nailed his Game 4 plate job.